Societies & Corporates :: Hindhead Golf Club is set in one of the most glorious natural settings and ranks amongst the best of Britain’s heathland courses. Whether you are a golf society, a group of golfing friends, a company entertaining clients or a charity wanting to hold a fund-raising event, you can be certain that Hindhead will give you the most successful and most enjoyable golf day that you and your guests will always remember. Our dedicated days for groups of 12 players or more are Wednesdays and Thursdays from March to December, when we can provide tailored packages to suit your every need. 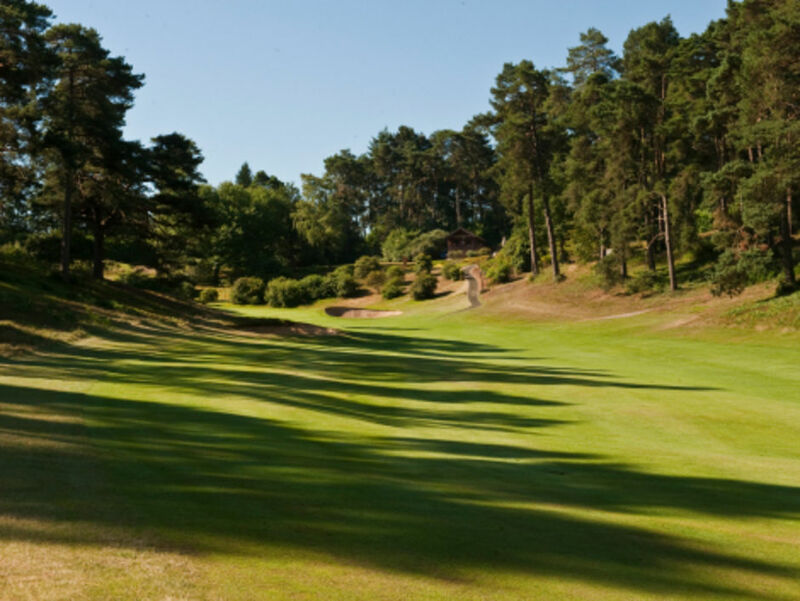 Hindhead's superbly presented golf course and its stunning views guarantee an unforgettable experience. Our clubhouse and catering team will give you the warmest of welcomes, and our PGA Professional can provide first class tournament administration and an excellent choice of prizes. Visitors are kindly asked to respect our Dress Code both on and off the course. If you are interested in holding a golf day at Hindhead please do contact our Club Office. Green fees for businesses are subject to VAT at the prevailing rate. Minimum catering spend is £10 p.p. "Very many thanks to everyone at Hindhead for providing us with such a wonderful day yesterday. From the starter's welcome, through to the excellent course condition, and on to the meal arrangements, everything could not have been better and our members have been fulsome in their praise". "May I say how very much we all enjoyed yesterday, the course was in excellent condition, the greens running true and everyone thoroughly enjoyed themselves. The food was first class, and again everyone enjoyed the lunch; thank you to the catering staff. Thank you to you and all at Hindhead for making our day such a success. "I just wanted to drop you and your team a short note to thank you for a great day last week, super facilities, friendly staff and a testing but enjoyable course. At our prize giving I took a straw poll on who had a good day and would be interested in the same again next year and received a resounding yes. A lot of happy customers. Please pass on my thanks to all the others who made our day a success".